Things I liked: This is an excellent pistol. It has become my favorite bb pistol. That includes blowback, non-blowback or any other bb shooter. It feels great in the hand, works superbly and is very accurate. If you take time to aim this it's fantastic for a smoothy bore bb gun. At 10 to 15 feet it will place almost every shot right in the "10 ring" with only the occasional flyer. Things I would have changed: Very little. I love this gun. What others should know: I think you'll be glad you bought this. Things I liked: Gun blows co2 into your face. Very low power. Functions good. Things I would have changed: Less blowback, more poems to BBC. What others should know: Functions great, really low velocity. What others should know: The Colt Commander CO2 Pistol give you the same exact performance as the Daisy PowerLine 415, but minus the fiber optic front sight and at 3.5 times the cost. How cool... ! Things I liked: This is by far my favorite BB gun. Blowback action is full cycle, powerful and realistic action, well balanced and accurate at 25 feet. I have over 6 thousand rounds through this gun. Helps keep me in good practice for the real thing. Things I would have changed: I have swapped the grips for a brown, though I would love to have "real" Colt logo grips. What others should know: Firing too fast in humid weather can freeze up the CO2 cylinder, causing some reliability issues with the blowback action. I sometimes alternate to a second magazine set up with a second CO2 cylinder to let things warm up if I'm planning on shooting a lot. Things I liked: This is a very well made 1911 copy , mostly metal , trigger is very light and pistol feels good in the hand. 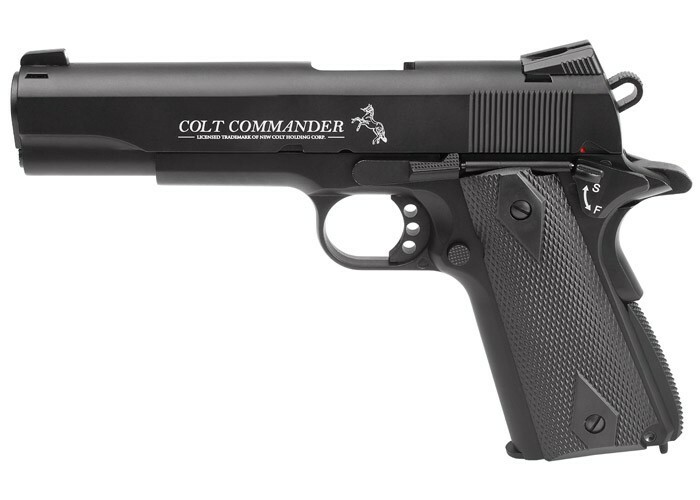 This colt commander is one of the most accurate co2 B.B. pistol I have to date and I have seven blowback B.B. guns . I shoot at a range of 30ft off a bench and umarex steel bbs are giving the tightest group .Using the six oclock hold is dead on at that distance. Money well spent cannot go wrong with this purchase. What others should know: Real 1911 grips will fit with slight modifications to the back of grips to clear for co2 cartridge using a dermal tool. Also would recommend removing slide from gun and lube slide rails with a good gun grease. Oil all metal to metal moving parts with Crosman Pelagun oil . Things I liked: Looks and feel of a real 1911. Very accurate right out of the box, I like the blow back. I read all the reviews on this pistol, that's why I bought this gun, reviews were very helpful. Excellant gun. Things I would have changed: Maybe better grips. What others should know: Use only Umarex CO2's with the rounded bottoms, other CO2's with flat bottoms and the seal will leak, I read this on the CO2's from other peoples experiance with the gun. Things I liked: Excellent mechanical quality. The gun shoots a little harder with the 4.5 inch barrel. The extra velocity allows the gun to shoot a little flatter. If you are willing to slow down and squeeze the trigger, you can get in a six inch target at 20 yards. I waited five months before submitting a review. I wanted to see if the pistol would hold up. I have put at least 40 C02 cartridges through the gun, amounting to 2,000 shots, with only two failures! One was a misfeed, the other, was the slide did not stay back on the last shot. Compared to other 1911s I have tried, this is outstanding. Things I would have changed: I had to apply a little epoxy glue to the loose front and rear sight. What others should know: The trigger has about an 1/8 of an inch of take up. Then about a 1/16 inch of creep. The let off is smooth though. Things I liked: First off, I love this pistol. I had a rough start with this pistol, because I tried to use Crosman co2 powerlets in it. DO NOT DO THAT!!! Use Umarex cartridges. You'll blow out the seal on the mag. I had no idea that this would be a problem, but after sending the magazine back to umarex, I was informed about this. Once this was resolved, it performed extremely well. I own a real 1911 commander in 45 ACP, and my local range is 45 minutes away, so this is a great training option. I can consistently hit a tin can at 11 yards, or 33 feet, first shot. And when I went to the range with my real pistol, my skill was much improved. Plus, it in the event of a jam or loose BB in the slide, it breaks down just like a real 1911, and is easy to clear. I've been very happy with this gun for more than a year. Great job, Umarex! (Plus their customer service, although a little slow, was excellent). The Novak style sights are very good, and easy to pick up, even with my 55 year old eyes. Things I would have changed: I would be sure to say up front to use only Umarex CO2 cartridges, or you will regret it. That info should be visible in the online description, and on the packaging. I only put a few mags through it before the seals went, then I had to wait for a repair. Plus, the length is not really commander length, rather it's a full size 5 inch, but that's nit-picking. It might be nice to have a rail on it, but that's also just for fun. Other than that, I can't think of anything else. Things I liked: Authenticity, fell, heft,trigger,blow back. If you have ever shot a real--- scratch that---- this IS a 1911 colt pistol that shoots .177 cal bullets. Things I would have changed: it would be nice if Pyramyd Air would offer more wood grips and other composite type grips. What others should know: Buy more BB's and CO2. Its your own fault for getting addicted to this hobby. Things I liked: Everything about this gun is like the real thing! Excellent in Quality! White dot sights make for easy target acquisition, excellent, crisp trigger pull. Take down like the real thing. Absolutely the best engineered CO2 Semi Auto on the market! Things I would have changed: No Changes.........PLEASE, do not mess with perfection! What others should know: Grips are replaceable with 1911 grips, only your bank account limits the possibilities. Order extra magazines for combat training. A bit of Frog Lube on the slide area and especially on the magazine make for smooth operation. Do not forget the Pell oil. Things I liked: I love this gun. It is exactly as described and will be a fun gun to plink with instead of firing 45 auto ammo all the time. May even take it to the range with me this week. What others should know: Buy lots of CO2 cartridges so you won't run out and an extra clip is a good idea as well. Things I would have changed: Nothing at this time, still getting used to item! Things I liked: This is the best engineered CO2 gun I have ever seen. It is all metal and looks, feels and operates like a 1911, of which I have 4. While it does not, of course, have the power and recoil of a .45 or .38 Super, it allows me to realistically practice in my back yard without having the neighbors called the cops. Things I would have changed: I could live without all the white writing. Things I liked: Sorry Sig Sour! Colt Commander BB Pistol has you beat. I do not have to customize grips . Uramax has already dome the work. I'm impressed!